First Tunnels was our first ever client. Nearly two decades later, we’re still their chosen ecommerce agency. It’s a fascinating company, manufacturing polytunnels, which are similar to greenhouses but covered in specially designed polythene rather than glass. The products sell well, to individual customers, government organisations such as schools and the NHS, and to celebrities including Hugh Fearnley-Whittingstall and gardeners’ favourite Alan Titchmarsh. But there’s always room for growth, and we have continued to make improvements to the website to ensure it continues to make the most of current and emerging ecommerce technology. We understand the importance of bespoke products. At eBusiness UK, our customers want solutions tailor-built to their needs. And at First Tunnels, it’s no different. 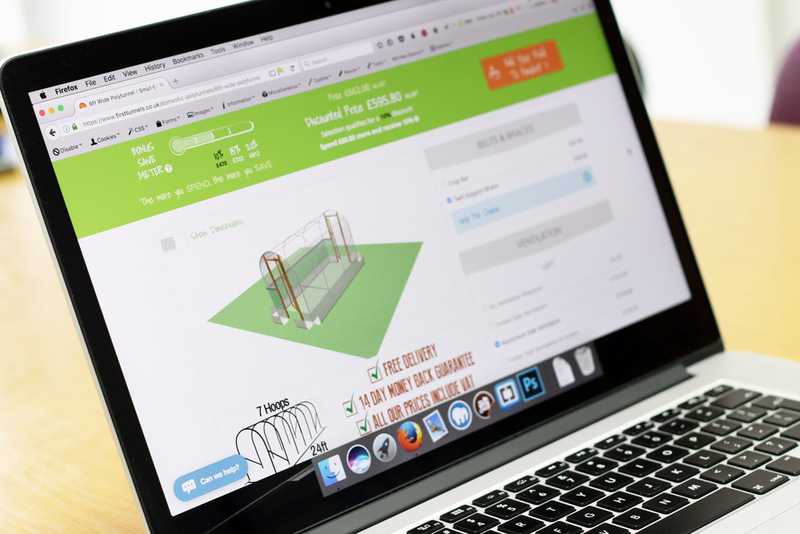 So in 2009 we created a product configurator, a neat piece of technology that allows shoppers to design and order custom design polytunnels. Built into the site, it allowed customers to purchase the perfect product, no need to shop anywhere else. Technology is evolving at an incredible speed. A cutting-edge solution developed a few years ago may no longer cut the mustard in today’s competitive marketplace. 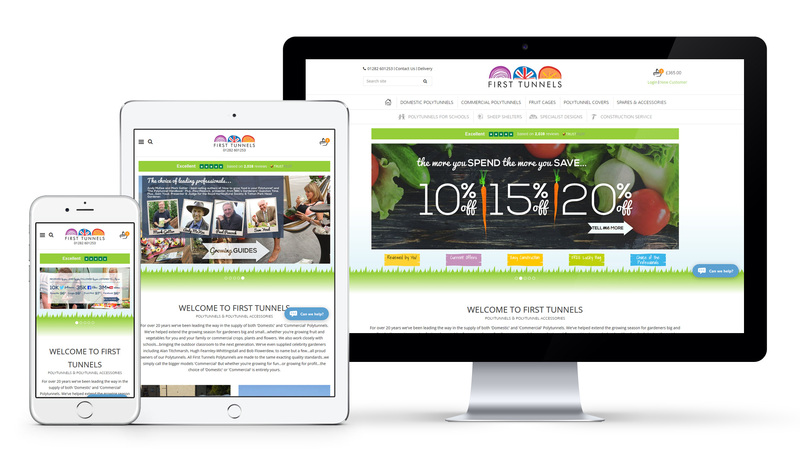 To solidify First Tunnels’ position as a market leader, we overhauled the site to be leaner, more secure and better equipped to grow with the company. This is great for customers, great for search engine rankings, and improved security by employing a variety of new, tried-and-tested methods of authentication. Desktop computers are just one of a variety of ways in which customers are browsing your company website. If it hasn’t been fine-tuned to look equally great on mobiles and tablets, you can be sure you’re losing customers. 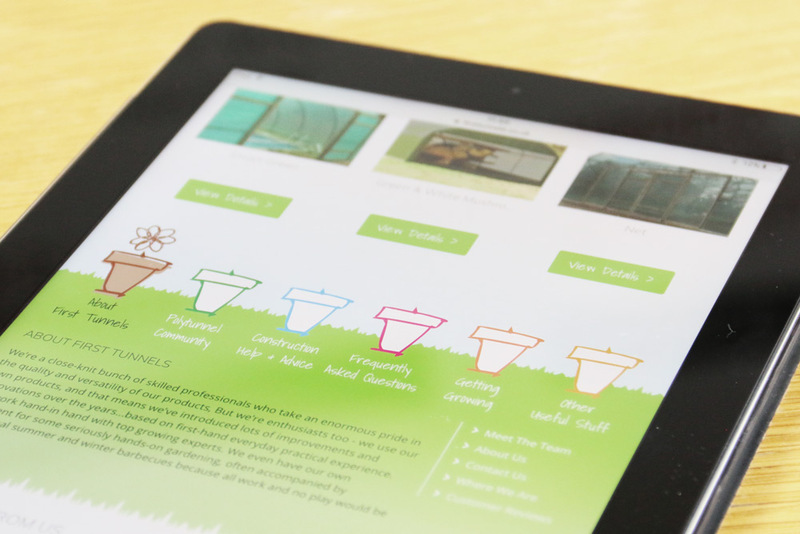 Our most recent upgrade of the First Tunnels website ensured it was fully responsive – whatever the device, it looks its best and works without a hitch. Bonus: search engines such as Google rank sites higher when they offer this capability, so it’s technology that pays off in more than one way. In addition, we added in a host of additional payment methods. Make it easier to buy, and customers stick around. Of course, an ecommerce site can’t only work for the customer, it’s got to be a money-maker for you, the retailer, too. We tapped into our first-hand experience making time2 a multi-million pound success to help First Tunnels maximise its sales potential. We added in a new feature which generated special offers and upsell opportunities, based on items currently in the customer’s shopping basket. And better still, we added Google and Facebook conversion tracking, so that First Tunnels can better understand user behaviour and motivations, enabling them to make smarter marketing decisions in the future. We’ve trusted eBusiness UK to be our eCommerce solution and development partner since 1998. Over the past 19 years our business has faced many challenges but our partnership with eBusiness UK has always provided us with the safety, security and reliability we’ve needed to help grow our business. Their level of service, attention to detail and delivery is incomparable. Over the years they’ve made a number of improvements to provide us with a scalable website that accommodates our growth. We’re looking forward to using their expertise in multi-channel implementation to grow our business even further. I would highly recommend them to anyone looking for a reliable eCommerce partner.